Unified, hybrid cloud architecture, either deployed through the public cloud, or via a private cloud appliance that maintains all data on the local network. Advanced attacks are not point-in-time events. Adversaries deliver attacks persistently, often using non-standard ports, protocols or encryption for subsequent attack stages. 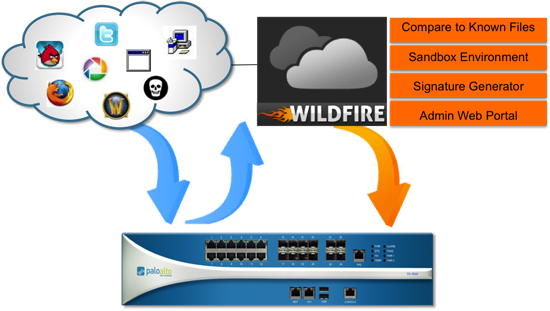 Like Palo Alto Networks next-generation firewall, WildFire provides complete visibility into all traffic - including advanced threats - across nearly 400 applications, including Web traffic, email protocols (SMTP, IMAP, POP), and FTP, regardless of ports or encryption (SSL). WildFire has a unified public/private cloud-based architecture that maximizes the sharing of threat intelligence while minimizing hardware requirements. The architecture allows the service to be deployed from any Palo Alto Networks security platform, with no additional hardware, or as a private cloud option (WF-500 appliance), where all analysis and data remain on the local network. Whether deployed as a public or private cloud, the WildFire analysis environment is shared across all security platforms on a customer's network, as opposed to deploying single-use sandboxing hardware at every ingress/egress point and network point of presence. Customers with a WildFire subscription also get access to fully integrated WildFire logs and reports via the standard Palo Alto Networks user interface or through Panorama. This log integration makes it really easy to quickly tie malware to users, applications, URLs, files or other threats for fast incident response, and for modifying your policies to reduce future attack vectors.